Your host Wayne, would like to welcome you to his home, Blythewood Manor Bed & Breakfast, located in the historically designated 'Bampfield Hall'. Our property Manager, Michelle, is available for any questions or concerns that you may have! Built in 1872, the house carries with it an amazing amount of history, and is set in an ideal quiet location just off scenic River Road. 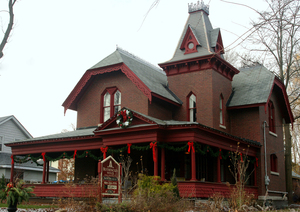 Many have described the home as a Gothic beauty, due to its very unique 'Gothic Revival' period architecture. 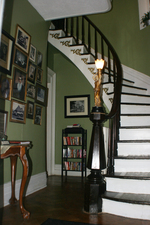 The interior of Blythewood Manor features the classic Victorian elegance of high ceilings and baseboards, crown-mouldings, inlaid hardwood floors, and a beautiful spiral staircase. The house is decorated with antiques & art, from the historic family photos featured throughout the house to the warm, rich red colours of the living room, guests will know that Blythewood Manor represents a unique Bed and Breakfast experience in Niagara. We currently offer 2 guest rooms, equipped with queen or king beds. Each room includes a private en-suite bath, and our Renaissance Room features a jacuzzi tub as well. The bus and railway stations are within walking distance, as is the 'Peoplemover' shuttle to all major tourist areas. We are approximately a 20 minute walk to the falls, (2 min drive) right along the beautiful, scenic, River Road, which runs along the Niagara Gorge. The house is smoke free for everyone's comfort, for convenience there is a covered smoking area on the veranda. All guest rooms are pet free, but *we do have cats* within our personal areas, and sometimes in the living-room/dining-room area. We advise against guests with severe cat allergies staying with us. We have free parking for our guests available on both the street, and in our private lot at the back of the house. Big, delicious breakfasts...it's what we're known for! We will go over the menu with you! fresh fruit salad, and a fresh muffin of the day! And for our hot meals which may include Bacon, Eggs & Homefries, French Toast, Pancakes, and Belgian Waffles. When you check in we will inform you of what choices are available during your stay.